Airtel Nigeria launched a revamped version of their SmartTRYBE tariff plan about a week. The all new SmartTrybe which offers cheaper calls, data and some freebies was unveiled at a Airtel event in Lagos. Calls at 11 kobo per second to all networks. What sets Airtel's Night Plan apart from what MTN already offers is that it allows users to accumulate more data by subscribing again and Night plan is valid from 12am to 5am. 250MB of data and 200 minutes for Airtel to Airtel calls for just 200 Naira. In addition users get 5MB of data for their first N100 of the week and 10MB for the subsequent N100 recharge as freebies. 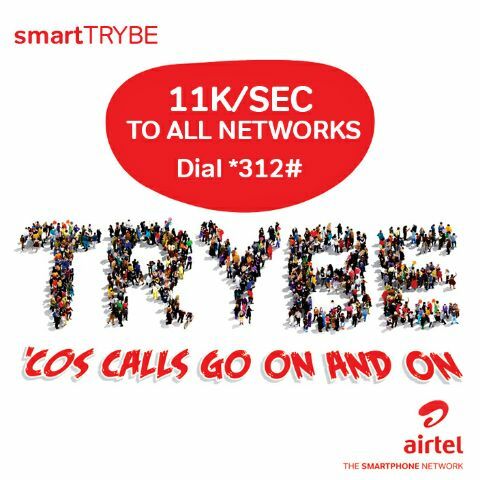 To migrate to the Airtel SmartTRYBE plan you would to dial *312#. Overall I think the Airtel SmartTRYBE plan offers quite a good deal for users, particularly with their night plan which is better than anything offered by the other telecoms at the moment.